That’s the bold claim made by Christopher Schwarz former editor of Popular Woodworking magazine about his first book “Workbenches from Design & Theory to Construction & Use”. I purchased the book through Waterstones by visiting a high street shop and ordering a copy for in store collection. I was pleased with the service and I was able to collect the book within a couple of days. This is the first contemporary Joinery & Cabinet making reference book I have purchased or read. Clearly this book has been produced with the North American woodworker in mind. All dimensions are in imperial and many of the timbers stated as cheap and easy to obtain are in fact, outside of the US, more expensive and only available from specialist suppliers. That said, there is a lot the British or European reader can gain from reading this book as the author focuses heavily on the “English” and “French” style of bench. The book begins by discussing what the author thinks are the failings of many commercially available and custom-built benches and the challenges encountered when using them. The next section moves on to discuss the types of wood used in the construction, the type of accessories and the various merits of each. 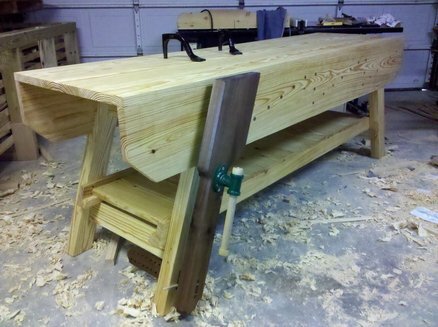 The noose then tightens and we move on to why the author selected the “English” and “French” style workbenches. There is then a detailed method showing the construction of each type of bench with plenty of photos, notes, cutting lists and drawings. Finally we have a section on the care and maintenance of your bench once you have made it. The flow and detail given within each section is logical and well researched and the book flows nicely from what feels a gentle introduction about workbenches leading ultimately to a conclusion where you can imagine yourself stood at the bench you chose to make. I found the writing style relaxed, accessible and coherent. 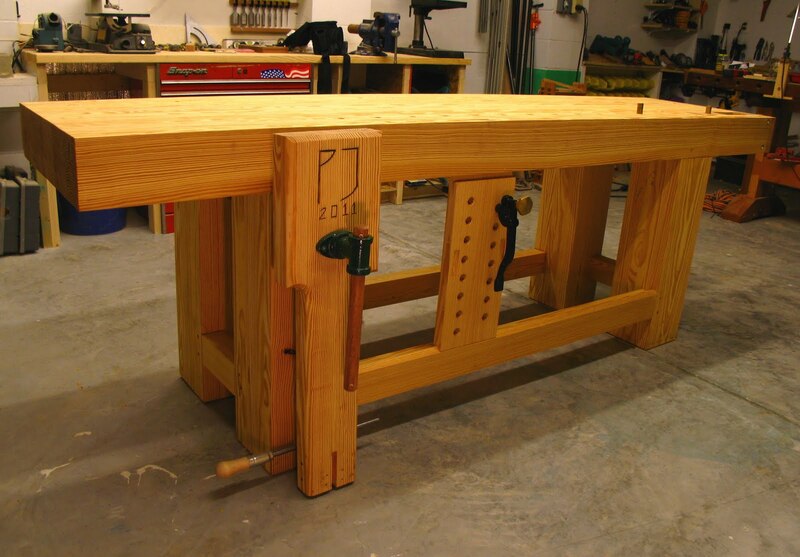 I felt I was discussing workbenches with someone who was keen to share what they had learned and was enthusiastic. My favourite section is “Matching Features to Functions” chapter. The author reviews (using his real experiences) the various merits of various appliances such as the quick release vice, planning stops and bench dogs. The best bit about this section is the context-based comparisons. At no stage do I feel I am being sold to, I simply get a review of what works best for each task weather it be random-orbit sanding or face planning narrow boards. Of course there will be some bias here as these approaches suit the author, however he does provide various options so you don’t feel pushed into any particular area. The weakest area is probably the timber selection but only if you are reading the book from outside the US. For the European reader I would suggest that European Redwood would be the best timber to use in place of the authors preferred Southern Yellow Pine. It’s also a book that you are unlikely to find on the shelf in the UK. You will most likely need to order a copy and have it sent mail order or call into your bookshop and order a copy.